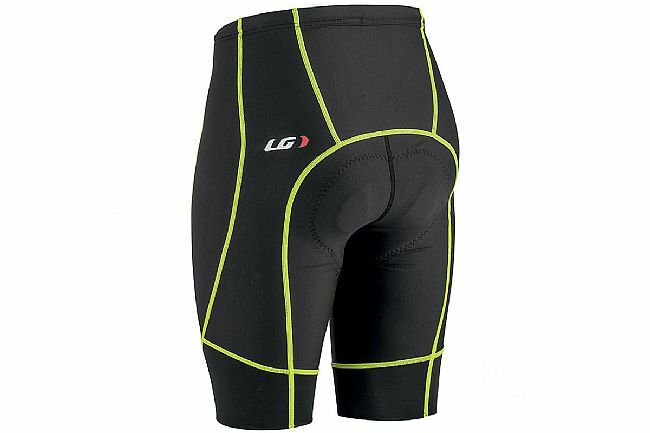 Louis Garneau's Men's Neo Power Motion Half Short features a 12-panel design with Power + Lycra® fabric for comfort and performance-enhancing compression. Its ergonomic construction features an elastic waist with drawstring closure and a seamless inner leg that prevents bunching. The 4-way stretch Motion Airgel chamois is ideal for long rides, and it uses a Cupron top layer that's antimicrobial and reduces skin irritation. At the hem, Powerband compressive cuffs secure the short without restricting circulation, and flat-lock seams throughout mean a frictionless fit. Features reflective logos on the front and back. 10.5" inseam. Available in multiple colors. chamois comfortable for 100 miles. dark blue looks awesome with a black jersey. I love the style of these shorts. I bought them too late in the year to get to wear them on a long ride but trying them on they are very comfortable. They do run small. I am 5'10 and 170 LBS with a 33 waist and I could not get size Large on. Had to exchange for size XL and they fit fine. Kudos to BTD for making the exchange easy. Get them on sale and they are a good buy. 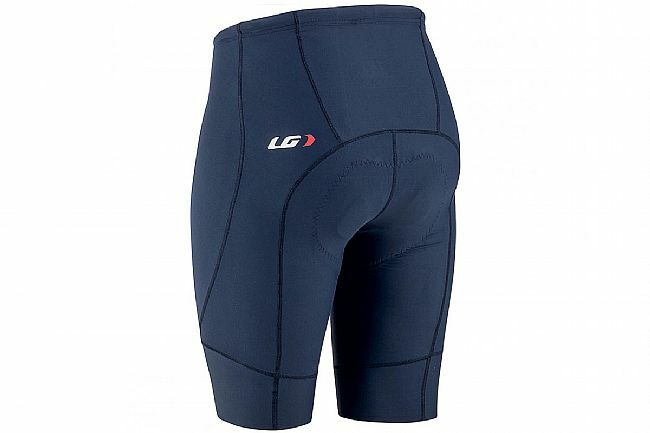 These are really nice shorts with a better chamois than most. I knocked off a star because they run very small. I am 5'10, 170 lbs with a 33 waist. The size chart puts me in a size medium. From past experience I know that many cycling shorts tend to run small so I ordered size large and literally could not get them all the way up. 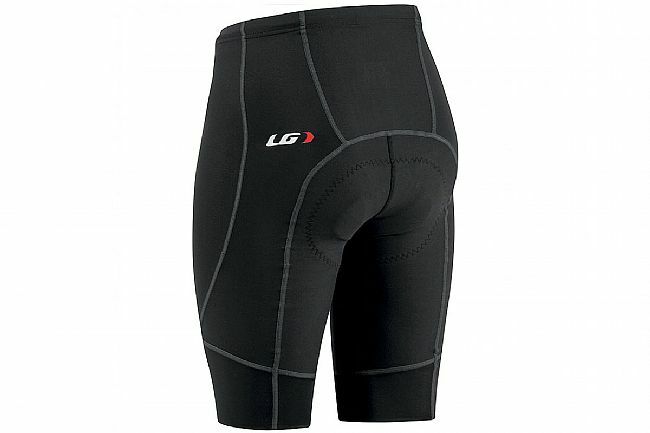 All of my other Garneau shorts are a size large with no problems. Had to exchange these for an extra large, 2 sizes bigger than the size chart for my measurements. Great customer service at BTD. They made the exchange easily. Get them on sale and they become a good value. Excellent fit & appearance. Have hand laundered them per product instructions 6 times and they lost little if any color retaining their compression. The chamoiscrotch padding are excellent making for a comfortable ride. So far best bike shorts I have bought. Fit snug. Has good padding but not bulky. Happy with choice. Best shorts I have used. Ride 50 plus at a time and there are no sore spots. Great fit .Comfortable on long rides. I haven't done many long rides in these shorts yet, but so far they have been awesome for rides up to 2.5hrs. They have just enough compression to make me feel secure. Overall the shorts are very comfortable and I would definitely purchase them again. I bought the older version of this short last year and it became my favorite short. I have very long legs so like the longer inseam. The new one is an inch shorter but still appeared to be longer than other shorts. In practice, however, It doesn't seem any longer than my Pearl Izumi, for instance. Furthermore, these seem significantly smaller all around. They are definitely tighter than any other short I owe, including the last year version of this same short. They are actually difficult to pull on. Otherwise, they are well made, great materials, have a good pad, and look good. I was just disappointed with the fit. Okay, I am an old guy, have a bit of a belly, and only ride about 3,000 miles per year. Great feel and support all the ride, no matter how long. Biking distances or just around town. I love the fit of these shorts. The one thing is that LG's fit chart is optimistic. I have a 32 waist which they say is their Med., however I wear a Large. I tried a Med. and could not even get over my hips. The Large is snug, but just right. Great wearing- I used pair on a cross-country (4600 miles) tour and they didn't wear out! I am a tall woman with long legs, so I buy men's shorts since they run longer (no problem with the pad). 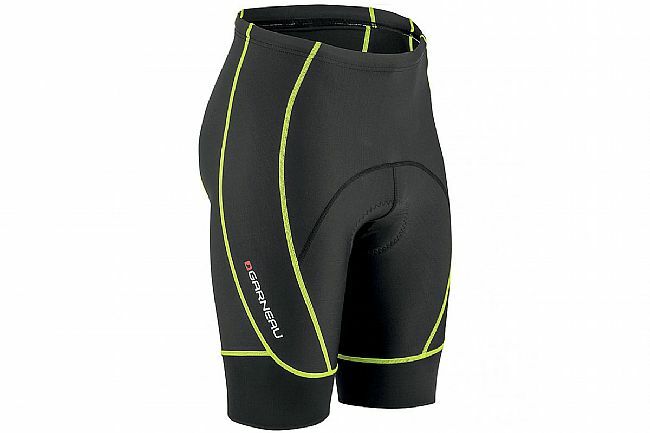 I've purchased Garneau shorts before and these shorts are even better for compression. I also like the yellow piping as they add to my visibility to drivers.